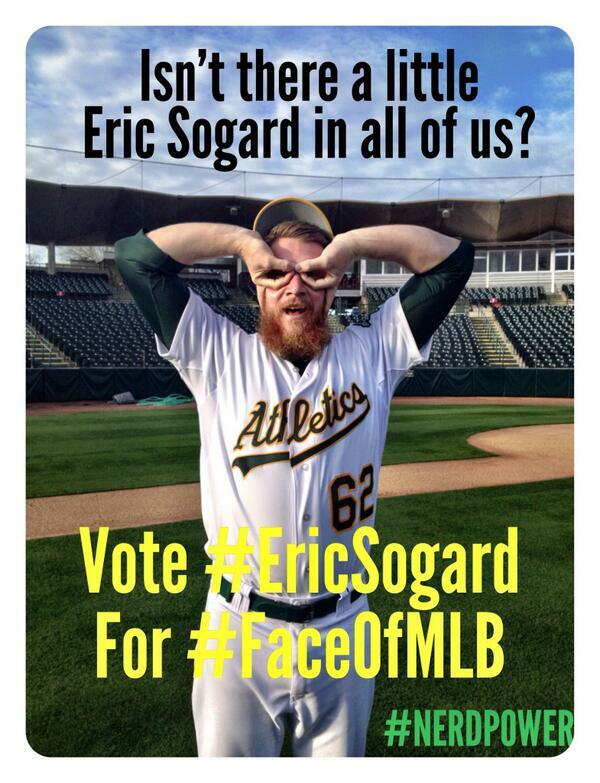 David Wright, Buster Posey, Jose Bautista…Eric Sogard? You’d think the last name wouldn’t typically come up in a conversation with the other three MLB stars, but the Oakland Athletics infielder has risen up the ranks on Twitter to become one of the final two players in the #FaceOfMLB competition. The #FaceofMLB competition is MLB’s way of leveraging the popularity of Twitter to get fans engaged and produce baseball related content. Running throughout the off-season, the competition has pitted two players against each other one at a time, with the victor (the player that has his designated hashtag tweeted the most during a specific time frame) moving to the next round. 32 players started this tournament, and only two remain: David Wright, face of the New York Mets and a star infielder; and Eric Sogard, a 27 year old infielder with the Oakland Athletics, carrying an unimpressive resume compared to the other players in the tournament. In fact, Sogard is mostly known for being the subject of Matt Garza’s caustic series of Tweets last year after a Texas-Oakland game, where Garza hurled a stream of insults that made fans everywhere question his emotional stability. Will #NerdPower prevail? Or will David Wright pull off the victory? The race is currently tied with both players at 50%, so we’ll most likely have to wait until tomorrow morning to see which player is given the lofty title as the Face of Major League Baseball.